Zucchini is overly abundant in the summer and since I’ve gotten a few from my CSA share last week. I’ve decided to bake it and add a few extra ingredients to style up a little. Zucchini itself is a low calories vegetable, per one cup chopped only contains about 20 calories. It is also a good source of vitamin C, B6, Riboflavin(B2) and Manganese, these nutrients will help skin integrity and energy productions. So, take advantage of this summer vegetables. Use a mixing bowl, add olive oil, garlic powder, salt and pepper together. Slice zucchini into 1/4 inch thick and toss zucchini into the mixing bowl with the oil mixture. Stir to evenly distribute the seasoning. Add in panko or bread crumbs and Parmesan cheese, evenly coat zucchini in the mixing bowl. 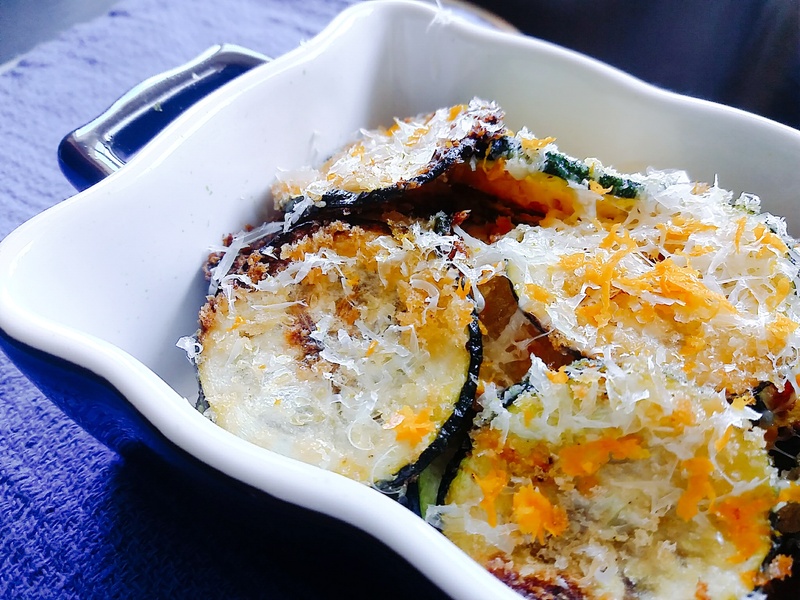 Lay zucchini in baking pan and baked for 20-25 minutes. Grate additional Parmesan cheese and some orange zest on top as garnish when it is done.